You have a vision for your dream barn. You’ve got the exterior down pat, but if you’re a first time barn owner, you may not have put as much thought into the stall doors for your horses. Building the right stall for your horse is crucial for creating a comfortable environment. Very intricate detail matters, from the type of stall doors to their hardware. There are two main types of stall doors to choose from when designing your horses’ ideal stalls—sliding doors and swinging doors. As with any option, each type of door has its pros and cons. Sliding doors are great investments for your horse stalls for a number of reasons. They are less hazardous than swinging doors because they won’t take up room in the aisle as you open them. 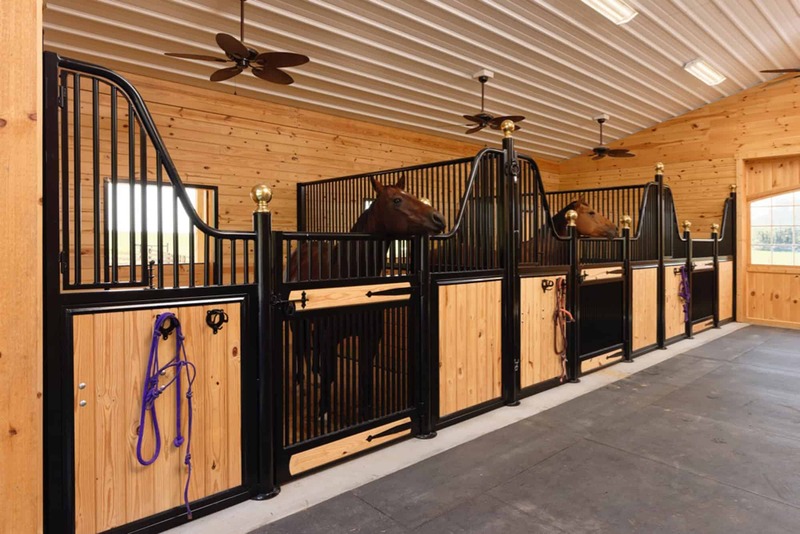 A sliding door simply slides on its track so both you and your horse can enter and exit the stall comfortably together without worrying whether the door is latched back properly or blocking space in the aisle. In addition, a sliding door allows you to adjust the stall’s entrance just wide enough for you to enter without risking your horse sneaking past you, anxious to get some sun. This makes accomplishing basic chores much easier, whether you’re changing your horse’s water or refilling feed. However, just as you can squeeze in, your horse can squeeze out if the door is not properly secured when you’re not around and he’s feeling particularly brave. If he tries to push his way through, your horse may risk hurting himself. Swinging stall doors are more traditional, though sometimes less practical. They take up more room in the aisle and make entering and exiting your horses’ stalls a bit more difficult, as your horse can easily nudge the door open wider for an easier escape. When leaving a swinging door open, always make sure it is secured flush with the wall so as not to clog the aisle and put others in danger when you have multiple horses out simultaneously. One favorite type of swinging door is the Dutch door. It was first used in residential homes in the 1600s in order to allow for better air circulation while keeping farm animals outside. Since then, the Dutch door has grown in popularity and is more often seen in barn architecture. Why is it still so popular? It makes an ideal exterior door. Although appearing as one solid piece when closed, the Dutch door is actually split in two sections. The top half often features a window and can be opened and secured outside with a hook and eye latch, which allows your horse to soak up fresh air and enjoy the view of the field or outdoor arena while secure in his stall. What better way to prevent your horse from feeling trapped in an otherwise stuffy barn? Dutch doors also make great exterior stall doors because they provide your horses with the opportunity to communicate with one another while they remain in their stalls, exercising their natural desire to socialize. Regardless of the type of stall door you choose, though, your doorways should always be equal to or wider than four feet to provide comfort for you and your equine friends. At Quarry View Construction, we understand the importance of practicality and comfort when it comes to caring for and housing your beloved four-legged friends. That’s why we take the time to learn your needs and expectations before and during our building process. Contact us today to find out how we can help make your horse stable dreams come true.